These are a few methods of making fire. This is a collection of my experiences of Bushcraft in the snow. Over the years there have been opportunities to teach others about survival skills and outdoor living. A great weekend at the 2009 Wilkes Spring Camporee at Kerr Scott Reservoir NC where Boy Scouts of America troops gathered from the Wilkes and Blue Ridge District. I was invited to participate as an instructor for two classes - Firecraft and Emergency shelters. I held my first day-course in Natural Disaster Survival held in conjunction with the W. Kerr Scott Dam and Reservoir Outreach Program. Merlefest is a Bluegrass Music Festival held annually in Wilkesboro North Carolina. Within this festival is the Heritage Crafts Tent where vendors demonstrate and show their crafts. 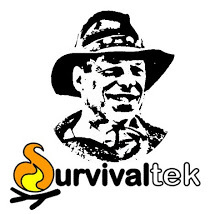 Survivaltek demonstrated firecraft and primitive cooking in conjunction with additional survival crafts and products.